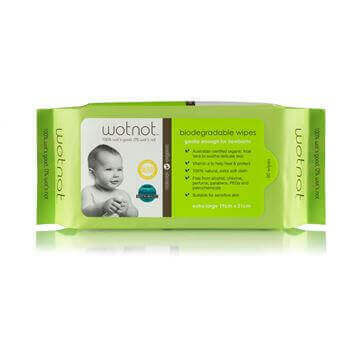 WOTNOT Baby Lotion is a beautiful velvety lotion enriched with certified organic oils which most closely resembles baby's natural oils. 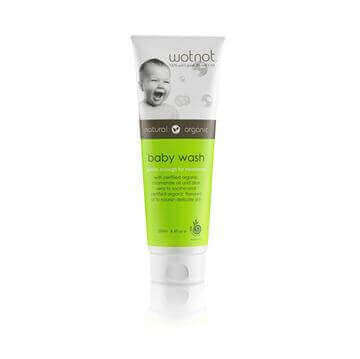 This along with added certified GMO-free vitamin E ensures that you baby’s skin is gently nourished and soothed from the outside in. It also contains certified organic flaxseed oil which is one of nature's richest sources of omega-3 and omega-6. Omega-3 is considered essential to human health but cannot be manufactured by the body. 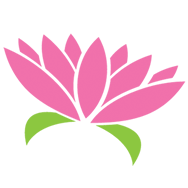 * As with any product, test patch first for allergy-prone skin. aloe vera leaf juice*, cetearyl olivate and sorbitan olivate (vegetable emulsifiers), olive oil*, cetearyl alcohol and stearic acid (vegetable emulsifiers), vegetable glycerine, shea butter*, flaxseed oil*, chamomile oil*, sweet orange oil*, d-alpha tocopherol (certified gmo-free vitamin e), panthenol, xanthan gum, sodium citrate, naticide (extra mild preservative.